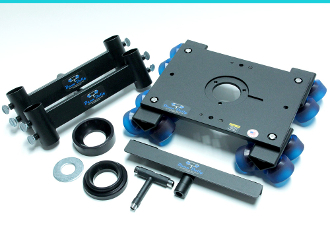 Complete kit includes the Dana Dolly, 75mm Adapter, 100mm Adapter, and 2- "Original" style Track End Brackets, Center Support, Washer, Tool. Made in the USA. Steel Track Ends with Aluminum Dolly and Adapters. Hard Black Finish. Soft Polyurethane Wheels with ABEC 7 Bearings.